The prevalence of childhood obesity has significantly increased over the years and there is a crucial need to implement cost-effective measures to reduce the development of metabolic complications. In fact, development of a comprehensive evidence-based strategy well supported with the health education campaign will definitely reduce the magnitude of the childhood obesity in the future years to come. La prevalencia de obesidad infantil se ha visto incrementada en forma significativa en los últimos años. Existe por lo tanto una necesidad crucial de aplicar medidas que sean rentables para reducir la aparición de complicaciones metabólicas. De hecho, la elaboración de una estrategia integral basada en la evidencia científica y bien apoyada con una campaña de educación para la salud, podría, sin duda, reducir la magnitud de la obesidad infantil en los años venideros. Agyemang C, Redekop WK, Owusu-Dabo E, Bruijnzeels MA. Blood pressure patterns in rural, semi-urban and urban children in the Ashanti region of Ghana, West Africa. BMC Public Health 5:114, 2005. August GP, Caprio S, Fennoy I, Freemark M, Kaufman FR, Lustig RH, et al. Prevention and treatment of pediatric obesity: an endocrine society clinical practice guideline based on expert opinion. J Clin Endocrinol Metab 93:4576-4599, 2008. Braet C, O'Malley G, Weghuber D, Vania A, Erhardt E, Nowicka P, et al. The assessment of eating behaviour in children who are obese: A psychological approach. A position paper from the European Childhood Obesity Group. Obes Facts 7(3):153-164, 2014. Bucher BS, Tschumi S, Simonetti GD. Childhood's determinants for high blood pressure in adulthood. Ther Umsch 69:295-298, 2012. Dumas N, Bergeron F, Gandonou M, De Wals P. Childhood obesity intervention evaluated in Canada: a review of the literature. Can J Diabetes 37(Suppl 2):S272-273, 2013. Endevelt R, Elkayam O, Cohen R, Peled R, Tal-Pony L, Michaelis Grunwald R, et al. An intensive family intervention clinic for reducing childhood obesity. J Am Board Fam Med 27(3):321-328, 2014. Ghosh A. Explaining overweight and obesity in children and adolescents of Asian Indian origin: the Calcutta childhood obesity study. Indian J Public Health 58(2):125-128, 2014. Hurtado-López EF, Macías-Rosales R. Focus of childhood obesity from pediatrics. Rev Med Inst Mex Seguro Soc 52(Suppl 1):116-119, 2014. Juonala M, Magnussen CG, Berenson GS, Venn A, Burns TL, Sabin MA, et al. Childhood adiposity, adult adiposity, and cardiovascular risk factors. N Engl J Med 365:1876-1885, 2011. Karnik S, Kanekar A. Childhood Obesity: A Global Public Health Crisis. Int J Prev Med 3:1-7, 2012. Larrosa-Haro A, Gonzalez-Perez GJ, Vasquez-Garibay EM, Romero-Velarde E, Chavez-Palencia CI, Salazar-Preciado LL, et al. Model for predicting childhood obesity from diet and physical activity. Rev Med Inst Mex Seguro Soc 52(Suppl 1):18-25, 2014. Ortega-Cortes R. Economical costs and consequences of childhood obesity. Rev Med Inst Mex Seguro Soc 52(Suppl 1):8-11, 2014. Robinson K, Lyons M. What works (or does not) in using communities of practice to advance action on childhood obesity prevention? Can J Diabetes 37(Suppl 2):S274, 2013. Salvadori M, Sontrop JM, Garg AX, Truong J, Suri RS, Mahmud FH, et al. Elevated blood pressure in relation to overweight and obesity among children in a rural Canadian community. J Pediatr 122:821-827, 2008. US preventive services task force. Screening for obesity in children and adolescents. US preventive services task force recommendation statement. Pediatrics 125:361-367, 2010. Valladares-Salgado A, Suarez-Sanchez F, Burguete-Garcia AI, Cruz M. Epigenetics of childhood obesity and diabetes. Rev Med Inst Mex Seguro Soc 52(Suppl 1):88-93, 2014. World Health Organization. Fact sheet No 311. 2014. Available from: http://www.who.int/mediacentre/factsheets/fs311/en/ [Last accessed on 2014 May 28]. 1. Childhood & Adolescence: Challenges in Mental Health. Journal of Canadian Academy of Child and Adolescent Psychiatry. 2013;22(2):84-85. 2. Evaluation of trained Accredited Social Health Activist (ASHA) workers regarding their knowledge, attitude and practices about child health. Rural & Remote Health. 2012;12(4):2099. 3. Prevalence of HIV and Syphilis in patients attending sexually transmitted infections (STI) clinic in an urban slum. Journal of Research in Health Sciences. 2012;12(1):7-14. 4. Tobacco quit rates among youth in an urban health centre of Mumbai: A cross sectional study. Addiction and Health. 2010;2(3-4):111-117. 5. Vulnerability to disasters – Are we moving ahead? 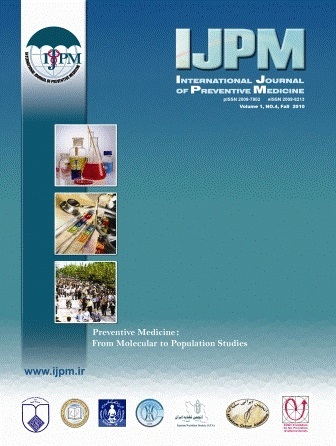 International Journal of Preventive Medicine. 2012;3(12):902-903. 6. Role of self-care in management of diabetes mellitus. Journal of Diabetes & Medical Disorders. 2013, 12:14. 7. Tuberculosis: Active case finding survey in an urban area of India, in 2012. Journal of Research in Health Sciences. 2013;13;(1):19-23. 8. Airborne infection control in healthcare settings. Infection Ecology & Epidemiology. 2013;3:21411. 9. Emerging and re-emerging infectious diseases - Public health perspective. International Journal of Preventive Medicine. 2013;4(6):736-737. 10. Coronary heart disease: Pandemic in a true sense. Journal of Cardiovascular and Thoracic Research. 2013;5(3):125-126.